ADV boots are a big ask. 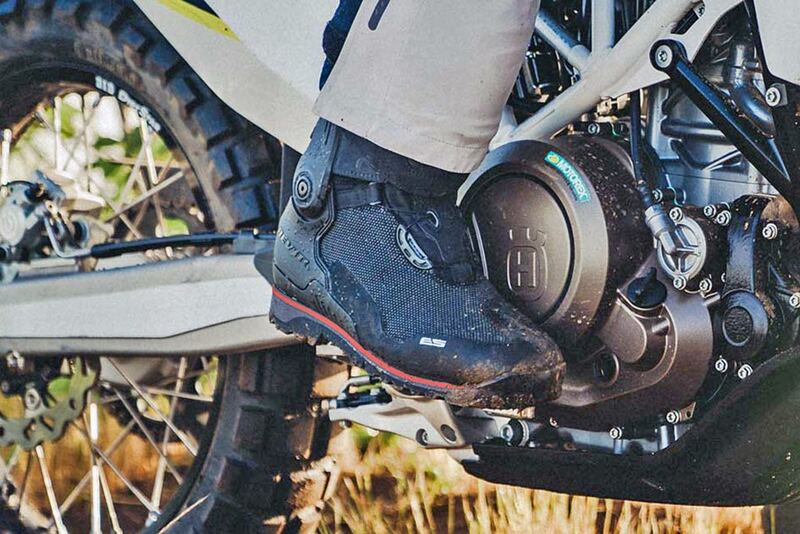 Like the bikes we ride, we need boots that come with a split personality, offering MX-level protection for all the off-road journeying, as well as flexibility and comfort when we’re ready to explore the waypoints. Enter REV’IT!’s very ambitious Expedition H2O. Claimed by REV’IT! to be the most technically-advanced adventure boot on the market, they are also one of the highest priced at $769.99. So what do you get for all that dough? Well, according to the manufacturer, just about everything. 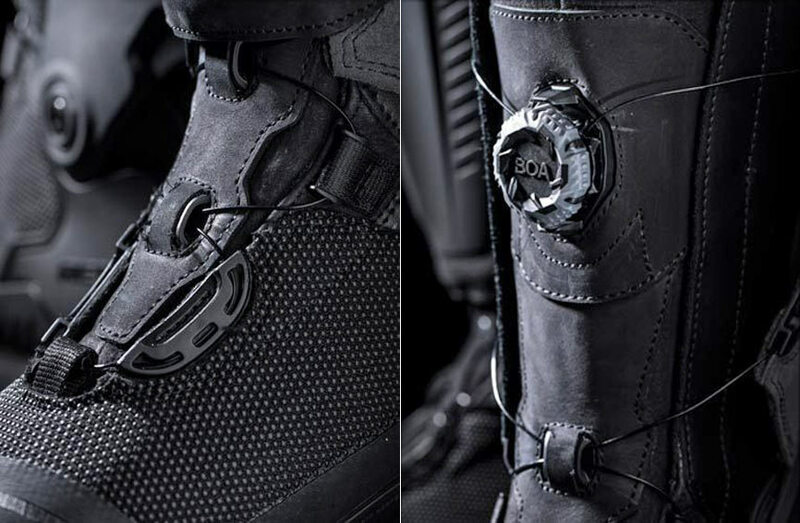 The Boa® closure system makes for a more adjustable fit, an extremely fast closure/release and a lighter weight boot. Once locked in place the Boa® reels and aircraft-grade stainless steel laces stay that way. Let’s start with the protective features. REV’IT! 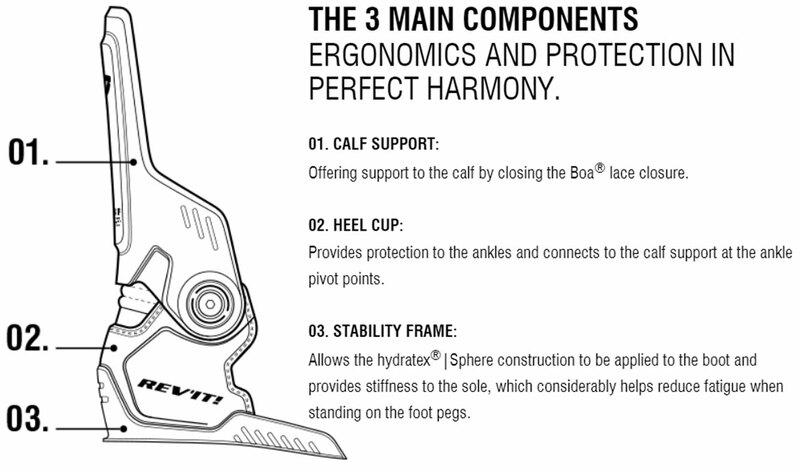 has wrapped the heel and ankle quadrant of these boots with a Dynamic Control System, which creates a supportive, yet energetic connection by using pivot points between a heel cup and calf support frame. It’s a hybrid of sorts, protecting the ankle from its most common demons – torsion and hyper extension – while allowing for more flexibility than a traditional moto boot. The under-heel portion of the plastic DCS system introduces some stiffness into the great-for-walking three-layer lament Vibram Apex soles, which should help reduce fatigue during long goes standing on the footpegs. 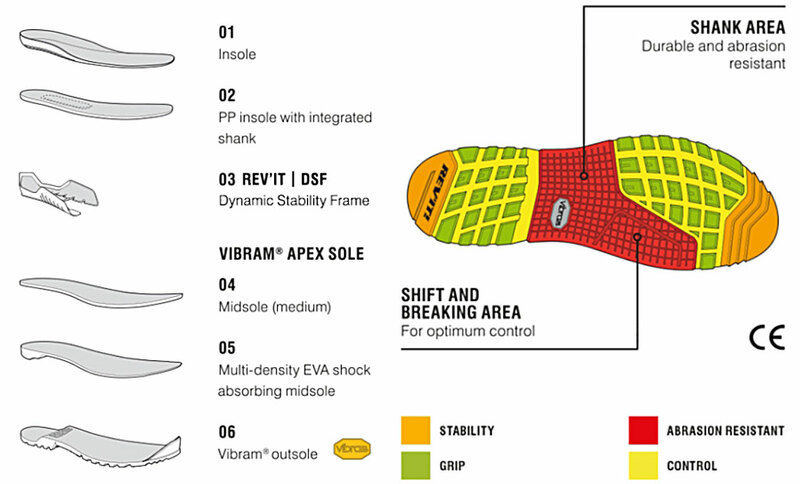 The Vibram® Apex sole features a self-cleaning, open lug pattern for traction and safety, an asymmetrical heel line that optimizes the boot position on the crank and an added multi-density EVA layer that reduces overall weight and absorbs shock. Another cool component on the Expeditions is the use of the Boa fastening system, old news in the snowboarding scene and something REV’IT! 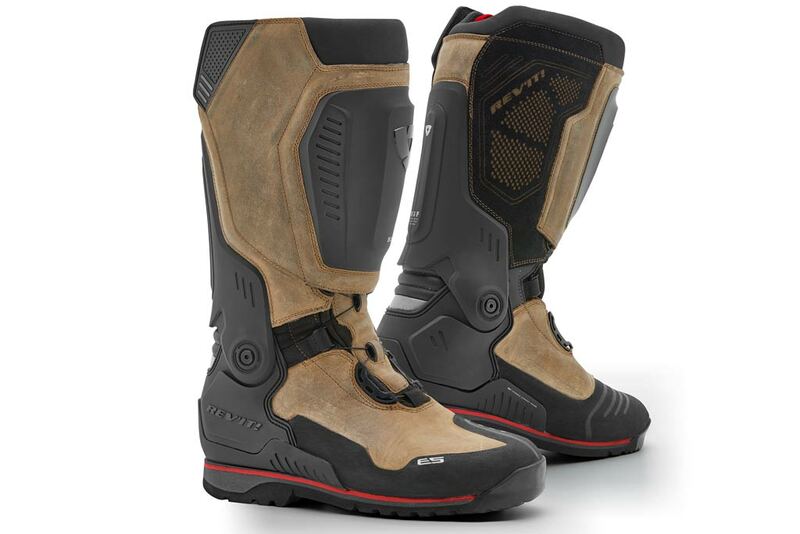 began introducing into mainstream moto in 2017 with the Discovery Outdry boots. Just slip your foot into the boot, click the dial and turn for an infinitely adjustable fit. When you want to get out, click the dial again for full release. A swatch of hook and loop inside the shin flap seals the deal. Touted as a four-season boot, the Expeditions are of course claimed to be H20-proof, utilizing REV’IT!’s own waterproof breathable Hydratex membrane. The felt-backed SuperFabric is said to retain heat in cold weather, making us wonder how these husky boots will feel on a hot summer day. At least the silver-ion antibacterial 3D mesh lining will help quell any funk. On paper these pricey kicks tick every box for serious adventure riders, including RTW-ready good looks. And yeah sure, it might feel like you’re buying two boots for the price of two boots, but then again, how many can you wear at a time?